﻿ Islands: Climate Victims or Champions of Resilience? Some development and adaptation efforts in island communities are leading the globe in terms of innovation, but support from the international community is necessary to fulfil the potential of these projects – and climate justice compels it, said panelists. One of the biggest challenges to small-island states is the “leaky bucket” of lost economic growth from climate-related disasters, said Gaetano Vivo, a disaster risk management specialist at the World Bank. Natural disasters repeatedly wipe-out new investments, trapping islands in a cycle of rehabilitation. To combat this in Haiti, the World Bank has strengthened hydro-meteorological data that can help identify and reduce vulnerabilities quickly. Weather can be especially fickle for islands, making early warning and forecasting all the more important. The Bank estimates that upgrading the production of hydro-meteorological information and early-warning capacity in developing countries can improve global productivity by up to $30 billion a year while reducing annual asset losses by up to $2 billion. Even when budgets are tight, Vivo emphasized that open data plans that promote sharing among stakeholders can increase resilience without additional costs. Despite these advantages, Vivo explained that widespread implementation of hydro-meteorological improvements has yet to take off. An analysis performed by the World Bank in Haiti found that the organizations involved in collecting meteorological data were unable to produce or disseminate information effectively and that institutions who should be clients, like the Ministry of Agriculture, were not willing to use their services. This was causing both gaps in information when data was not shared and redundancies when other organizations try to collect and store data independently. To address these inconsistencies, the World Bank developed the Global Facility for Disaster Reduction and Recovery, which brings together various UN agencies and more than 30 donors to provide technical assistance and best practices on disaster risk management to national meteorological institutions in developing countries. Better coordination between government ministries and agencies is a near-universal recommendation for adapting to climate change. Some small-island states are moving especially quickly towards this goal. John Furlow, a senior climate change specialist at USAID, said the agency’s model for climate adaptation has evolved from a focus on specific vulnerabilities to a more integrated approach that includes concerns across a broad range of interests. While helping Madagascar design a climate adaptation plan in 2007, Furlow found that various ministries were developing their own plans in isolation, sometimes assigning different activities for the same plot of land and not taking into account how changes in one sector might affect another. The resulting action plan called for increased economic growth, land tenure, road coverage, protected areas, tourism, and rice production without adequate land and resources to satisfy these competing interests. The experience led USAID to a new “development first” approach that begins with overall development objectives and then assigns roles to various government agencies accordingly. Climate change is included among the risks and challenges to achieving those goals, encouraging each agency to incorporate adaptation into their plans. This framework was piloted in Jamaica with a workshop in 2012. Government and industry representatives were asked to identify both climatic and non-climatic stresses affecting a given sector, such as agriculture, and which government ministries would be involved. By revealing overlaps in the effects of climate change across sectors as well as the lack of capacity to deal with it, this multidisciplinary approach made the environment a planning factor for over 20 ministries and departments rather than just the Environment Ministry and led the government to shift from a single national climate policy to including climate in 12 separate sector policies. USAID has since introduced this approach to other countries and launched a national adaptation planning global network that serves as a forum for countries to learn from one another’s national adaptation plans. This network also works to engage with other bilateral donors and improve donor coordination in order to make adaptation programs more sustainable. Still, even the most adaptive models can sometimes fall short. Maxine Burkett, associate professor of Law at the University of Hawaii at Manoa who specializes in climate justice and vulnerability, explained that in instances where destruction is so great that it lies beyond the possibility of mitigation or adaptation, an insurance-based, risk and loss approach becomes necessary. In these scenarios, aid cannot fully provide for the rehabilitation needed following disasters, such as the recent devastation caused by Typhon Haiyan in the Philippines and Tropical Cyclone Pam on the island of Vanuatu. Determining how to pay for loss and damage is a “new frontier” for climate negotiations, Burkett said, and islands are “policy pioneers.” In 2007, the Caribbean Catastrophe Insurance Facility was founded as the first-ever multi-country risk pool, allowing for lower insurance premiums by transferring risk across 16 countries. Islands in the Pacific and Indian Ocean are now seeking to replicate its success. The Alliance of Small Island States, a coalition of 44 small-island and low-lying coastal countries, has strongly advocated for an effective loss and damage mechanism that formalizes insurance and risk transfer schemes at the international level. The alliance aims to get finance-specific language in the climate treaty to be negotiated in Paris later this year with action points on how to design and introduce a structure for international funding that acknowledges shared liability, responsibility, and compensation between the Global North and South. “Supporting institutions will be key to assist in their efforts to have a more…novel and ambitious policy that will aid islanders first but of course will aid us all over time because these are policies that we need for all of our communities,” said Burkett. Islands have developed innovative approaches at the community level as well, said Roger-Mark De Souza, director of population, environmental security, and resilience at the Wilson Center. So-called population, heath, environment programs in Madagascar and the Philippines have excelled in promoting multiple developmental goals within an adaptation framework by supporting women’s empowerment and reproductive health services alongside natural resource management, conservation, and climate change preparedness. De Souza highlighted the success of Blue Ventures, a population, health, and environment program in Madagascar that has demonstrated how merging access to family planning and other health services with community-based resource management has improved the resilience of coastal livelihoods. The organization notably helped villages recover after Cycle Haruna in 2013. Other community-based projects include a UNDP climate adaptation program promoting exchange between 37 small-island states, with the aim of incorporating lessons learned from local efforts into at least one national or sub-national policy by 2016. While collaborative resilience initiatives from island communities in many ways surpass expectations, they are by no means sufficient. “Communities very often say that we don’t live our lives in silos, that we need an integrated response, and donors are more and more looking at community-based responses by investing in these social dimensions,” said De Souza. Sources: UNDP, USAID, World Bank. 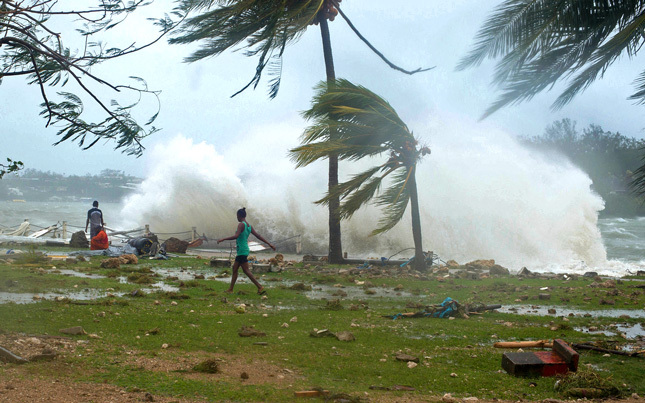 Photo Credit: Cyclone Pam makes it way towards Vanuatu, March 13, 2015, courtesy of UNICEF Pacific.